Don’t be surprised to see people waiting outside Le Cartet before the restaurant’s even opened. 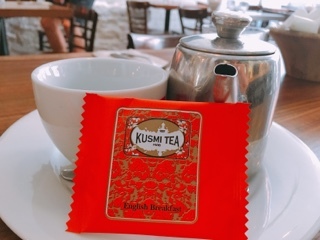 During the warmer months there’s several tables outside, so having a pre-brunch drink (sourced elsewhere, of course) can easily be accommodated before the doors finally unlock at 9:00 am. 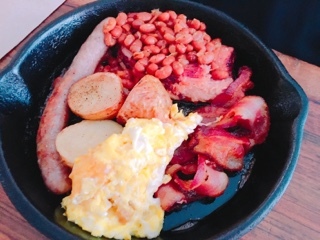 Available during weekends until 3:30pm, the restaurant’s a popular place for brunch – locals and tourists alike. 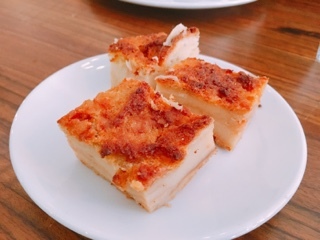 Accompanying their brunch mains is a glass of fresh squeezed orange juice and an amuse-bouche: a lovely creamy bread pudding square that’ll convert those who normally complain the dessert’s too mushy. Instead, it’s a soft cakey delight, a wonderful way to tide over anyone who’s hungry, but if you can resist scarfing it down right away, a lovely sweet ending. Le Cartet’s take on eggs benedict is the brunch toscan ($19). 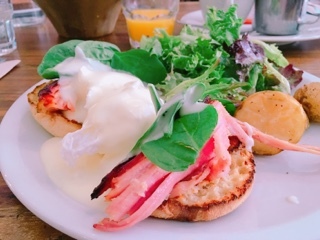 The poached eggs, spinach and English muffins are topped with Mornay sauce (a cheesy béchamel) instead of customary hollandaise. Yet, it’s the ham that’s the highlight – no sad deli meat slices here; instead, you’ll discover thick hunks of flavourful smoked pork that meaty and delicious. The duck fat roasted potatoes aren’t overly heavy, having been lightened with a spritz of lemon, and finished off with a hefty side salad the dish makes for a well-rounded meal. For carnivores, the scrambled eggs in the brunch des cantons ($19) is accompanied by an even bigger hunk of the aforementioned ham, sausage and bacon! A sprinkling of baked beans and more duck fat roasted potatoes promises you’ll be well fed for a day of sightseeing. 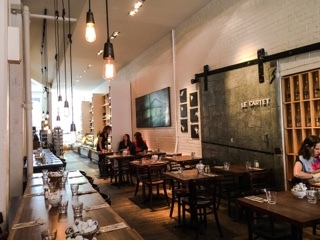 With a no reservation policy, arrive before 10:00am to get a table – Le Cartet’s dining room is fairly spacious with a number of long communal tables that can accommodate groups of varying sizes. 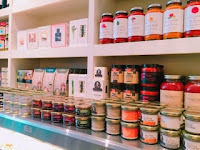 If you do have to wait, take time to wander around their market area that’s stocked with so many artisanal delights. With a variety of chocolates, confections, baked goods, and sauces it’ll definitely keep you entertained – although some hungry impulse purchases may result. 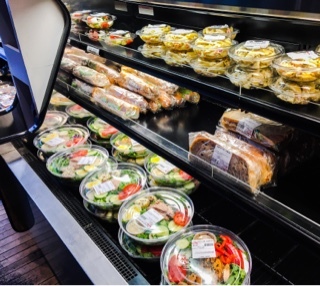 Otherwise, Le Cartet also has a fair selection of grab-and-go salads and sandwiches available for those who just cannot wait any more. 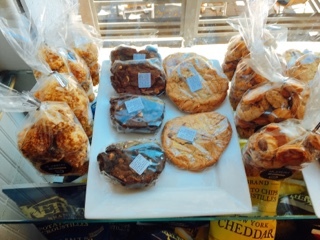 But, maybe just hang in a little longer … that bread pudding and ham would just be a shame to miss.